Make your way through a dark and dangerous dungeon with a group of firemakers and protect them from a fiery and unknown foe. Keep your wits about you to make it through this cavern and back to safety! 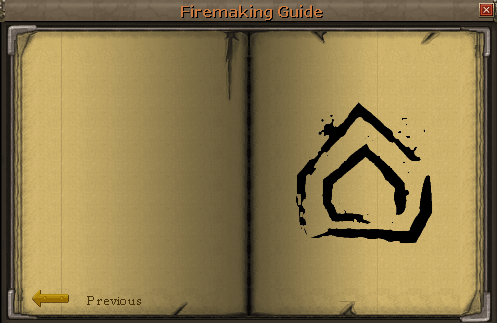 Join the firemakers on their journey through a cave system, searching for The Firemaker's Guide: a great book of secrets written by the most powerful firemaker in recorded history. Finding the book is one problem; getting out alive is another. Speak to one of the firemakers gathered around the cave south of Eagle's Peak Mountain. Note: This quest is completely safe. 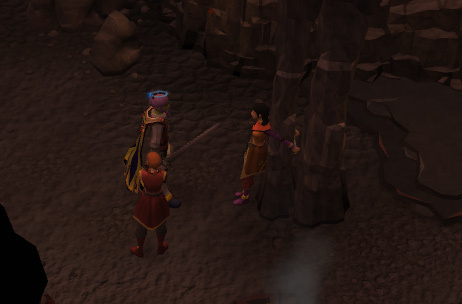 If you get too close to death at any point during this quest, one of the firemakers will pull you to safety. 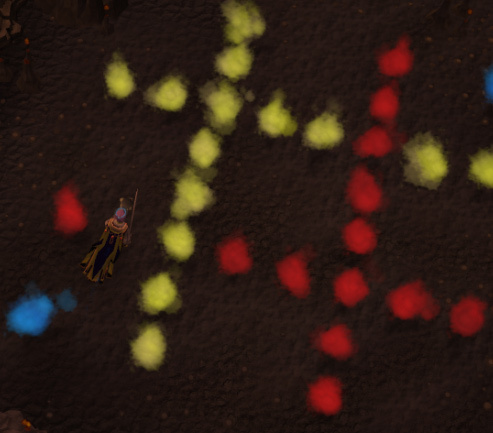 To begin the quest, speak to any of the seven firemakers gathered around the entrance to a cave, as marked out on the map shown below. A cutscene will then ensue in which you talk to the firemakers, and ask them why they are gathered around the entrance to the cave. You will then be introduced to the band of traveling firemakers. They will inform you that they are fire enthusiasts, who travel around the world entertaining people with fire. They will then explain that the reason they are gathered around the cave is that they believe firemaking secrets dwell within, the likes of which we cannot even begin to imagine! It has lain, forgotten for over a thousand years, and they are going to be the ones to retrieve it! You discover that the knowledge of this cave came to Isis in a dream, and you are somewhat skeptical of the fact they have followed voices in a dream to find some fire. Nevertheless, being the bold adventurer you are, you agree to help them in their retrieval of the fire secrets, as they are too scared to go down alone, and wish for you to protect them. Select the "Yes, let's go" option, and Phoenix will proceed to tell you that you have a terrible name, charming fellow. You then descend into the unknown caves below. The first room you encounter is a large cavern, with a patch in the middle which is occupied by a number of red flames. Should you try to step on to one of these flames, Flint will stop you, offering you help in the form of an item he invented to start a fire when there is an absence of wood. A pitch can. You can light the fires using this directly, without wood. However, these fires will be much hotter than a normal fire, so you can't step over them the way you can on a log fire. 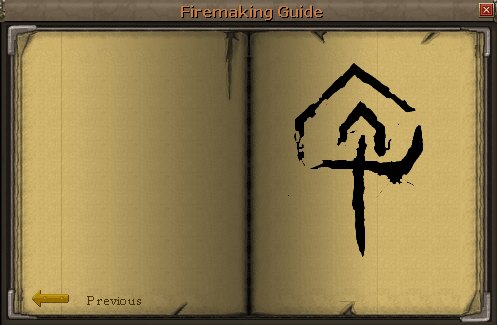 If you speak to the party of firemakers, they will tell you the red fires appear to have been lit in some kind of symbol, but some of the fires have gone out. In order to complete this room you must relight the fires to make the correct symbol. If you ask the group what they think of the fires, Lina will respond "They look like a pattern, don't they? Some kind of arrow, perhaps." The arrow must be made facing the direction of the entrance to the cave you came in by. Once you complete the arrow another cutscene will begin where you and the party fall through the floor to another cavern below. The cave below is dark, with no lights. Light the giant fire pit nearby to illuminate the room and decide your next course of action. On a small altar in the northern end of the room, you can find a Firemaking Journal Chapter 1, pick it up and the room will begin to shake. 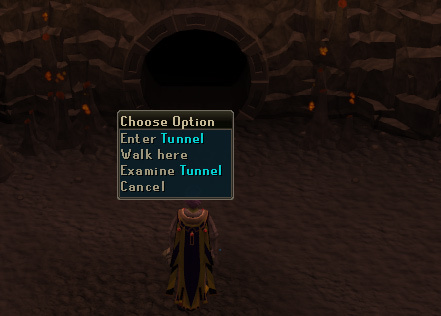 An NPC called "Unknown" will cry out "ZAMORAK? DO NOT HIDE FROM ME, COWARD! YOU HAVE MADE A MISTAKE COMING BACK HERE, I-"
Unknown will then realize you are not Zamorak and begin to question you, you discover Unknown has been in slumber for thousands of years, and realizes that Zamorak's plan (presumably his ascension to Godhood) has succeeded. Unknown will then declare that you should "play a game" and the lights in the cave will once again be extinguished. Re-light the fire pit in the middle of the room, and you will see Phoenix is now lying dead in the cave. Emmett declares the murder was carried out through him, the spirit was in his head and he couldn't stop it. He will also put a name to the Unknown; Char. Char will then begin to mock you for being betrayed by one of your own, shout back at Char and you will learn the rules to the game. Char has possessed another of your party, and the entrance to the next cave is unlocked. Char states however, that she has taken the mind of another one of your party, and someone else will die, unless you figure out who it is. Enter the nearby tunnel to continue. You enter another cave with another collection of red fires on the floor. 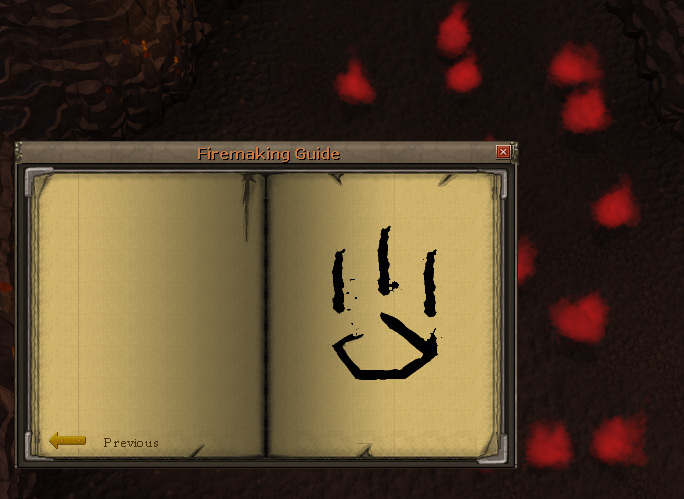 Read the firemaking part of you journal and select "unknown", and a diagram will appear to help you through this room. Light the fires according to this diagram to advance. After you do this Char will speak to you again, saying she has not yet regained all her powers, but can still absorb the energy from the fires you light. Char will then dim the lights and begin throwing rocks at you. Begin picking the rocks up and adding them to the pile of rocks on the eastern wall in the room. Once you have built a pile of rocks high enough, you can climb them to advance to the next room. If you take too long doing this, you will begin to take constant damage as the room grows too dark. Once you enter the next room, light the fire in the middle of it to illuminate the room once more. The rest of your party will then rejoin you. There is another part of the journal in the northern room, pick it up to continue. Char will then tell you that retrieving her journal only makes her grow more stronger! You will then question who she is, to be told she is Char, the most talented fire enchantress of Zaros' army! 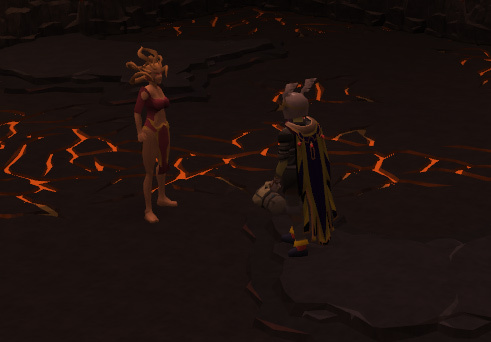 Char will explain to you that long ago she was very close to Zaros, but was betrayed by her own ally, Zamorak. She then used zarosian magic to bind herself into the journals as she knew she was dying, and she expected Zaros to come for her. Alas, it is you instead. She then gives you the option of choosing who was possessed, and tying them to a pillar so they cannot harm anyone. It is suggested you cannot be possessed, as Char speaks to you directly. It is up to you to find out who is under the influence of Char. Speak to the members of the party to attempt to work it out. The only people who act strange are Twig and Emmett, both of whom accuse the other. The person under control this time is Twig. Tie him up to the pillar and Char will wish you good luck, and extinguish the fire. Re-light it to discover nobody has been killed, and be congratulated by Char. 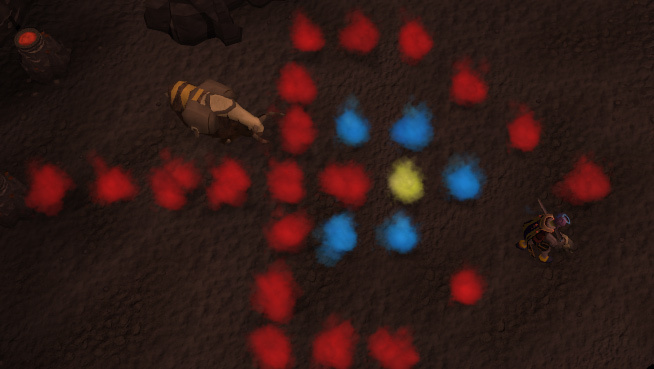 This room also has two types of powder, red and yellow, to allow you to change the colour of your fire. The shape is that of a fire, with the yellow part being the inner layer, and red the outer. Complete this as fast as you can, before the fires extinguish, and Char will once again absorb the fires, telling you not to get too comfortable. Two walls of fire will then be thrown at you, and you must stand on the square where the fire will not hit, to avoid taking damage. You may then proceed to the next room. 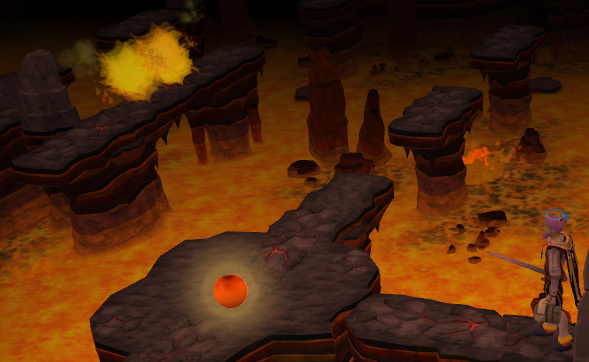 Go through the tunnel, and you will emerge in a giant lava maze, guarded by lava balls. Char informs you that you will need to light the fires around the room, as it is about to get very dark in here. The objective in this room is to light all the fire pits, jumping from ledge to ledge, and moving the pillar switches to help you do so. Go west, light the fire and push the switch. Go west, light the fire and switch, at this point you must act swiftly. Standing under the unstable rocks for more than a second makes them collapse and will put you back at the start of the room. You will now be in another dimly lit cave, light the fire pit in this room and your party will once again rejoin you. Now take the third part of the journal, notice that Char's chathead is beginning to take a more solid form now. Char then begins to tell you what happened to her thousands of years ago. She was a general in Zaros' army, Zaros sent a small party to investigate Seren's activities in her crystal city, including Char, Zamorak and a few members of Zamorak's ranks. You can then inform Char that Zamorak is a God now, to which Char will react violently, and full of sorrow for her own failures. 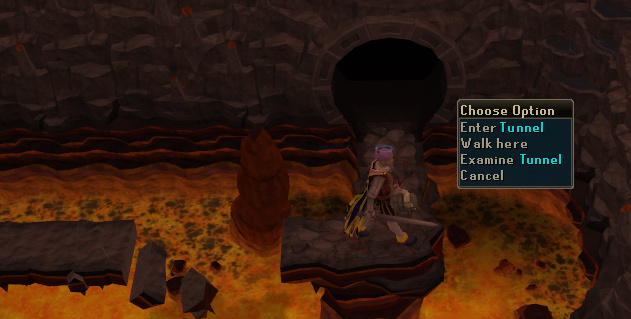 Char hints that she was ambushed in the wilderness by Zamorak and his followers once separated from Zaros, then tells you she has said enough and that you must now continue. You must now discover who has been possessed by Char again and tie them up. This time Sera has been possessed, so tie her up to protect your party. You may now advance to the next chamber. You are now in another fire room, this time with Red, Yellow and Blue flames. 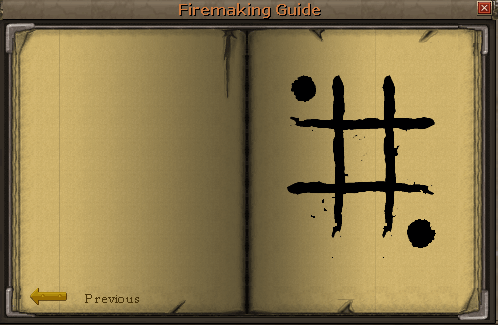 There are now three powders to choose from to change the colour of your fire, and once again you can see the diagram you must make in the third chapter of the journal, which appears to be a grid with a circle in two corners. Char will once again begin speaking to you, telling you that you are no fool. (Yay!) You will once again be rushed by two walls of fire which you must avoid by hiding in the gaps. You may then proceed to the next chamber. You will now emerge in a large cave that appears to be a giant grid. In the grooves in the wall, you have the option to Light, Light Left or Light Right. In this room Char sets balls of fire out to get you. She will run you through a quick, tutorial-like section, where she sends them one at a time. The red balls come directly for you and will damage you if they get too close, other balls leave trails of fire behind which harm you if you stand on them, and some balls light fires of their own accord. The idea here is to escape the balls by trapping fires, and try not to trap yourself in with them! You should aim to be in the middle of the walls, as the balls seem to spawn only around the corners of the room. Your only objective here is to survive the onslaught of fire! If you do this correctly you will not need much food, but it is best to take some just to be sure. After finishing the wave, you can progress to the next room. Once in here light the fire pit for your group to rejoin you again, and take the journal from the stand in the northern part of the room. 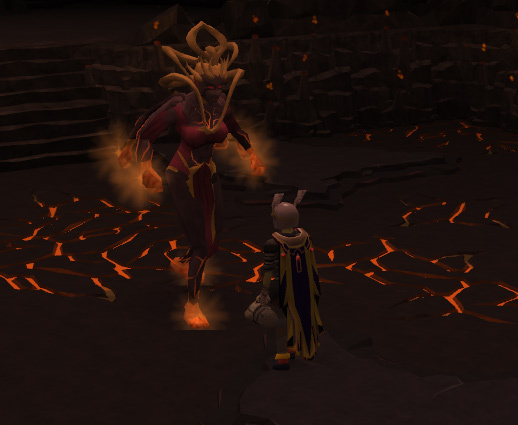 After taking the journal, Char now feels ready to relive what happened to her, and explains that amidst an ambush by Elven warriors, Zamorak stabbed her with a poisoned dagger, knowing that it would not kill her, but that she would be unable to reach Zaros in time to warn him - forcing her to suffer more. Then it is time to decide who has been possessed once more. This time it is once again Twig. Tie him up, or Lina will die. After this you may continue to the next room. Char will then talk to you, and tell you you'll have to find some fire that you can take with you, extinguishing the light in the room. You can light the fire pit for some temporary light, but this will automatically extinguish again after a few seconds. After lighting it, you must click the fire again to take a torch from it, you may now proceed down the narrow tunnel, with caution. As you proceed down the narrow corridor, shadow-like tendrils appear and slowly make their way towards you to grab you. If they do hit you, you will take damage here. 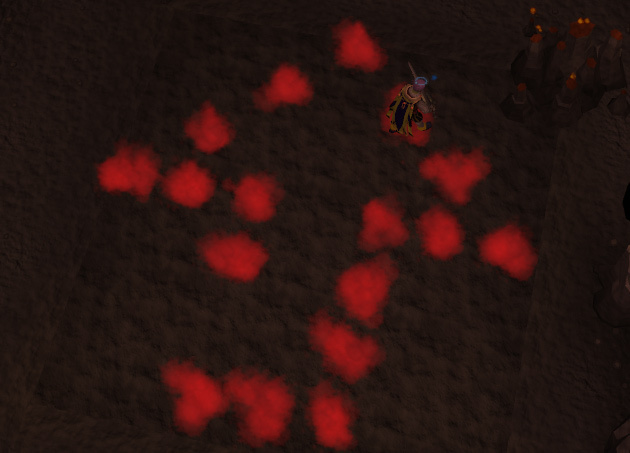 If you click on the base of the black tendrils you wave the fire on the stick towards them and make them retreat temporarily. For this to work you must be clicking the base of the tendrils. Once you go through the door at the end, light the fire again for your party to join you, and take the journal again. Once again you must choose who has been possessed. This time it is Emmett. Tie him up to save Twig, and continue on through the door. Now, you and any remaining members of your party will be in a chamber with another journal extract, pick this extract up. You will be advised by Emmett to tie them all up and protect them, which you then do and take the journal. This will allow Char to return to her true form, and it is now time for the boss battle. Note: For this part it is recommended to bring a range weapon of your choice, any will do. Knives or darts are the most recommended. Climb down the steps to the north, and keep going until you come face to face with Char, Level 501. Talk to her to begin the fight. The objective to this battle is to run around, so it is advised to wear as light armour as possible, as weapons and armour make no difference here. After lighting 5 or 6 fires around the room, attack her, hitting 101 damage per fire lit. As such, the more fires you have lit at one time, the higher you will hit. When Char lights up and starts glowing she becomes invincible. Do not fire on her or go anywhere near her in this stage, as she can hit extremely high. It is possible to "extinguish" her by luring her to the water, but this is not necessary. If she is able to hit you here, she can hit over 700, so be extremely careful, as if you get pulled to safety here, you will have to re-start the fight. When Char is lowered to around half of her health, she will once again send flame walls at you, to escape this, you must stand in the gaps in the wall, or else risk taking high damage. These walls will continue to attack you until the end of the fight. After each wall, continue lighting fires and attacking her. When she is nearly dead, she will declare "Enough! ", and cease the battle, and admits defeat. Char will then declare that Zaros will return and have his revenge, and permits you and the remnants of your group to leave. She will then give you The Book of Char, and bid you leave her. You may now exit at the back of the chamber to complete the quest. Your group will declare they are headed to re-join the circus, and that you may visit them there sometime. They then leave you with the secrets of Char's firemaking. After the quest is over, the entrance to the tunnel will now be sealed. 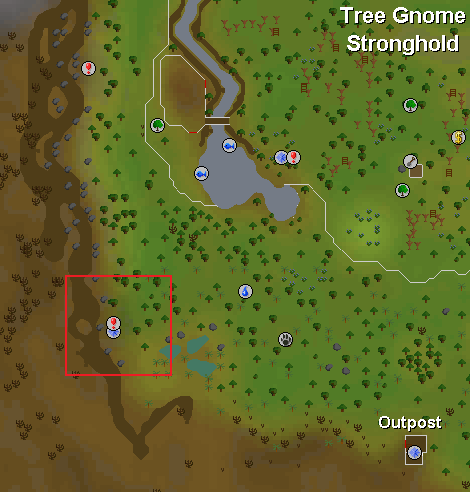 However, north of the quest start point, another tunnel will now be opened. Char is down here, and will permit you once a week to train your firemaking using her special techniques. 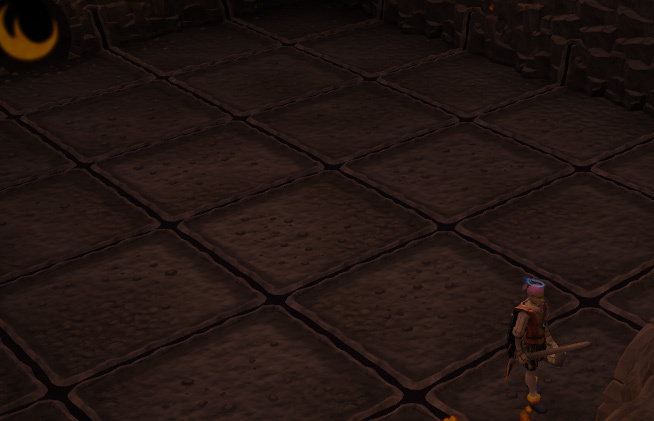 There are also four pets here that you can obtain. 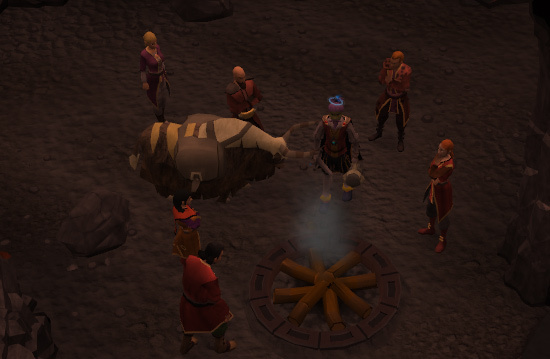 Also, there are now two new firemaking events in the circus, that give you access to firemaking XP and a new outfit.